About a year ago, I spent an afternoon hunkered down in a tent in the desert of the southwest corner of Oregon. I was dodging roaming clouds of gnats and an oppressive heat, and I was battling a sudden, heavy fatigue. There was a vague sense of expectation and muffled dread, like in early Polanski, and I felt as though I were on drugs. Nodding off and on, during waking moments I found myself gazing at the scene framed by the tent flap: mountains, dusty sage, the edge of a lake. I was oddly content. A week later, I was on the Oregon coast. This time I was on drugs. I sat in a leather armchair, staring through a second-story window: at the shore, the lighthouse, the people, and the gray sky. I felt a similar contentment. In fact, geography aside, the two experiences were nearly identical. Leon Battista Alberti is credited with first articulating the idea that a painting is like a window. In Book One of his On Painting, he writes: “First of all about where I draw. I inscribe a quadrangle of right angles, as large as I wish, which is considered to be an open window through which I see what I want to paint.” The window is a key metaphor for Alberti’s broader advocacy of a naturalistic art based on the illusion of recessive space. His quadrangle, moreover, is the staging area for the systematized application of one-point perspective. The window, then, both emblematizes and makes possible the innovations and ideas of Renaissance art, serving as both its paradigm and method. Though emblematic and oft-cited, Alberti’s talk of windows is actually brief. Let us, then, recast this metaphor back into the terms that Alberti favors throughout much of Book One, those of geometry. At their simplest, windows are planes, as is the space beyond. To contemplate the view through a window is to look through one plane, out onto another. The outline of the first plane (the window) frames the second (the ground), determining a view. The window is “propped up”; the space beyond is “thrown back.” And it is, I think, these two features, the window’s boundedness and the juxtaposition of two perpendicular planes, the picture plane and the ground plane, which together create the sense of pleasure, of satisfaction that I experienced looking through the tent flap and through the second-story window last summer. Before concluding, I’d like to consider two more windows. Section One of The High Line Park opened in June 2009, Section Two in 2011. Among the park’s outstanding features are a pair of sort of small open-air theaters comprised of terrace-like rows of benches that slope slightly downward, each set of benches facing a rectangular frame of cinema-like proportions. 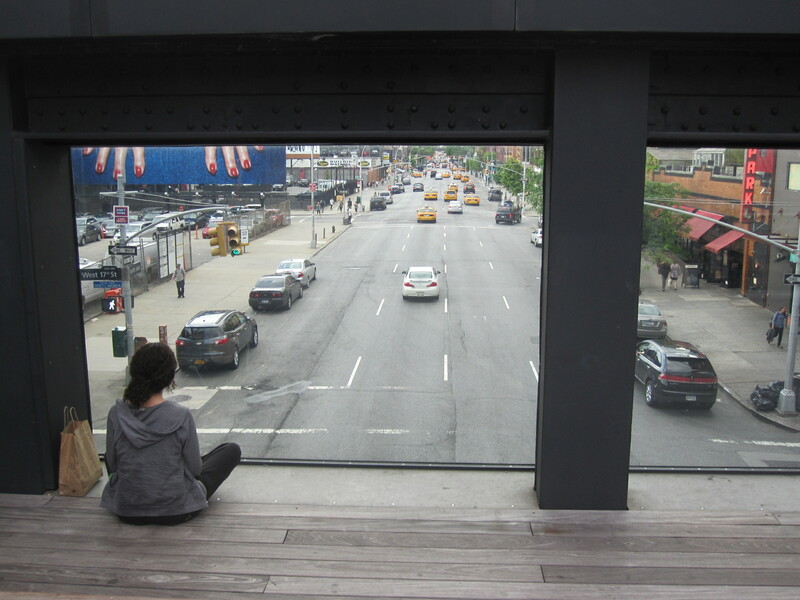 The park map identifies the larger of these two windows as the “Tenth Avenue Square” while the smaller is the “26th Street Viewing Spur.” At any time during the park’s open hours, you can find a handful to dozens of viewers sitting and lounging, looking out on the passersby, buildings, and the receding, one-way traffic below. Like the joke about the fish that are oblivious of water, people, I think, are rarely aware of surrounding space as such. Should one stop to reflect on the experience of space, it must seem amorphous, complex, largely undefined—or, if it is at all, vaguely spheroid, with the viewer at the imagined center and “space” radiating outward. Alberti’s conception of perspectival space is, in the end, schematic; although convincing, its fixity and clarity are unrealistic. Looking through the High Line windows—or any window or window-like opening, for that matter—one has the rare, satisfying, experience of space as it ought to work according to the logic of the fixed one-point perspective described by Alberti. Space is outlined for the viewer, contained within a coherent boundary; at the same time, depth becomes clear. This is most obvious at the window’s edges. Objects that straddle or pass into that frame seem to jump, to skip slightly, as the transparent picture plane suddenly snaps into place over top of them, forcing them back, away from the viewer, deeper into space. For Alberti, of course, the window is a metaphor, useful for conceiving of the picture plane and for describing the illusionistic representation of a ground plane within. This idea, perhaps overly familiar, has limited appeal for me. But the more immediate, more mundane experience of looking through a literal window remains fresh.